A 68 years old woman disappeared two days ago at village Kirandul in Raipur district of Chhattisgarh state in India. She lived 200 metres away from the house of his son. She could not be traced even after much efforts. After two day, her son found lose soil in the backyard. Getting suspicious, he dug the lose soil and saw food of the mother. Woman Bela Rai used to live alone in her house. Last time, she had taken meal with his son Vipul and returned to her house. Next day, she did not turn up for breakfast and lunch. On being searched, her house was found locked. People though that she might have gone to an acquaintance’s house. But, when she did not return till late evening, intensive search was made to trace her. Mystery shrouded disappearance of woman for two day, unit the son found her buried. Police took out the body from the pit. All jewellery on the woman’s body and cash and valuables in the house are missing. 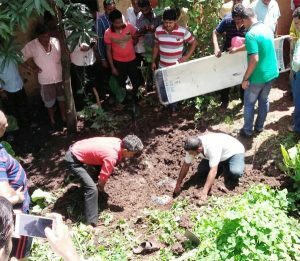 It is speculated that robbers killed the lady and buried her body inside her own courtyard.